Thomas Jefferson was a famous President from USA, who lived between April 13, 1743 and July 4, 1826. He became 83 years old. He was the third president (1801-1809), second vice president (1797-1801) and an American statesman. He was ambassador to France, political philosopher, revolutionary, land use, gardener, land owner, architect, archaeologist, a slave owner (he tried throughout his tenure to repeal or reduce slavery), author, inventor and founder of the University of Virginia. 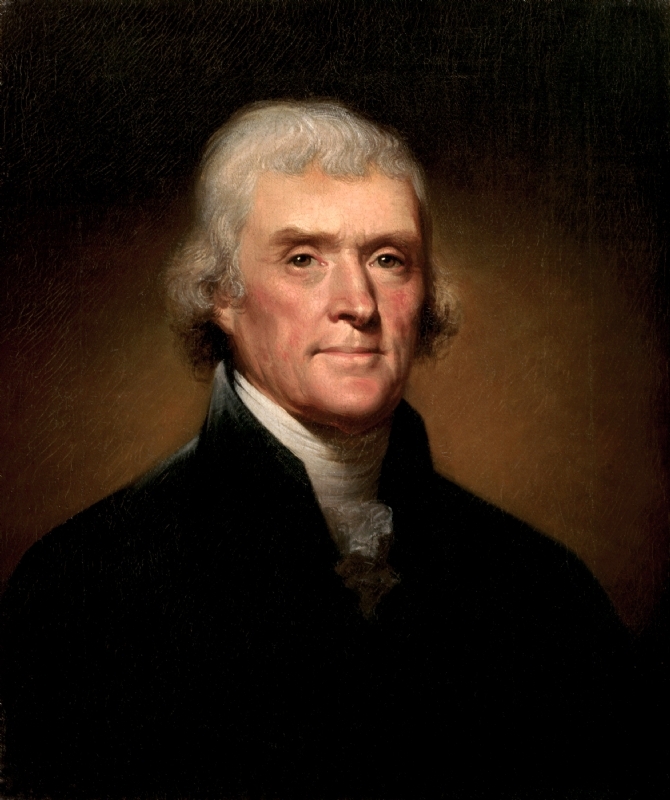 Jefferson was one of the key people behind the United States Declaration of Independence. Many people consider Jefferson as the most brilliant man that has ever been president. President John F. Kennedy welcomed 49 Nobel laureates to the White House in 1962 by saying that "I think this is the most extraordinary collection of talent of human knowledge that has ever been gathered in the White House, with the possible exception of when Thomas Jefferson dined alone. "companies from his time as president include the Louisiana purchase and Lewis and Clark expedition. Our collection contains 144 quotes who is written / told by Thomas, under the main topics: Fitness, Friendship, Government, Motivational, Travel. "Do you want to know who you are? Don't ask. Act! Action will delineate and define you"
"Determine never to be idle. No person will have occasion to complain of the want of time who never loses any. It is wonderful how much may be done if we are always doing"
"When we get piled upon one another in large cities, as in Europe, we shall become as corrupt as Europe"
"When angry count to ten before you speak. If very angry, count to one hundred"
"When a man assumes a public trust he should consider himself a public property"
"To compel a man to furnish funds for the propagation of ideas he disbelieves and abhors is sinful and tyrannical"
"There is not a truth existing which I fear... or would wish unknown to the whole world"
"There is not a sprig of grass that shoots uninteresting to me"
"The world is indebted for all triumphs which have been gained by reason and humanity over error and oppression"
"The whole commerce between master and slave is a perpetual exercise of the most boisterous passions, the most unremitting despotism on the one part, and degrading submissions on the other. Our children see this, and learn to imitate it"
"The way to silence religious disputes is to take no notice of them"
"The spirit of this country is totally adverse to a large military force"
"The glow of one warm thought is to me worth more than money"
"The earth belongs to the living, not to the dead"
"The Creator has not thought proper to mark those in the forehead who are of stuff to make good generals. We are first, therefore, to seek them blindfold, and then let them learn the trade at the expense of great losses"
"The constitutions of most of our States assert that all power is inherent in the people; that... it is their right and duty to be at all times armed"
"The care of human life and happiness, and not their destruction, is the first and only object of good government"
"The boisterous sea of liberty is never without a wave"
"I was bold in the pursuit of knowledge, never fearing to follow truth and reason to whatever results they led, and bearding every authority which stood in their way"
"I think with the Romans, that the general of today should be a soldier tomorrow if necessary"
"I own that I am not a friend to a very energetic government. It is always oppressive"
"I find that he is happiest of whom the world says least, good or bad"
"I do not take a single newspaper, nor read one a month, and I feel myself infinitely the happier for it"
"I believe that every human mind feels pleasure in doing good to another"
"I am mortified to be told that, in the United States of America, the sale of a book can become a subject of inquiry, and of criminal inquiry too"
"I am an Epicurean. I consider the genuine (not the imputed) doctrines of Epicurus as containing everything rational in moral philosophy which Greek and Roman leave to us"
"I abhor war and view it as the greatest scourge of mankind"
"How much pain they have cost us, the evils which have never happened"
"Every government degenerates when trusted to the rulers of the people alone. The people themselves are its only safe depositories"
"Every citizen should be a soldier. This was the case with the Greeks and Romans, and must be that of every free state"
"Errors of opinion may be tolerated where reason is left free to combat it"
"Enlighten the people generally, and tyranny and oppressions of body and mind will vanish like evil spirits at the dawn of day"
"Don't talk about what you have done or what you are going to do"
"The natural progress of things is for liberty to yield and government to gain ground"
"In defense of our persons and properties under actual violation, we took up arms. When that violence shall be removed, when hostilities shall cease on the part of the aggressors, hostilities shall cease on our part also"
"Fix reason firmly in her seat, and call to her tribunal every fact, every opinion. Question with boldness even the existence of a God; because, if there be one, he must more approve of the homage of reason, than that of blindfolded fear"
"Peace and abstinence from European interferences are our objects, and so will continue while the present order of things in America remain uninterrupted"
"No occupation is so delightful to me as the culture of the earth, and no culture comparable to that of the garden"
"No man will ever carry out of the Presidency the reputation which carried him into it"
"I have sworn upon the altar of God, eternal hostility against every form of tyranny over the mind of man"
"We are not to expect to be translated from despotism to liberty in a featherbed"
"Ignorance is preferable to error, and he is less remote from the truth who believes nothing than he who believes what is wrong"
"The second office in the government is honorable and easy; the first is but a splendid misery"
"The moment a person forms a theory, his imagination sees in every object only the traits which favor that theory"
"Sometimes it is said that man cannot be trusted with the government of himself. Can he, then be trusted with the government of others? Or have we found angels in the form of kings to govern him? Let history answer this question"
"Peace, commerce and honest friendship with all nations; entangling alliances with none"
"It is error alone which needs the support of government. Truth can stand by itself"
"I hope we shall crush in its birth the aristocracy of our monied corporations which dare already to challenge our government to a trial by strength, and bid defiance to the laws of our country"
"Force is the vital principle and immediate parent of despotism"
"Experience hath shewn, that even under the best forms of government those entrusted with power have, in time, and by slow operations, perverted it into tyranny"
"Walking is the best possible exercise. Habituate yourself to walk very fast"
"So confident am I in the intentions, as well as wisdom, of the government, that I shall always be satisfied that what is not done, either cannot, or ought not to be done"
"I know of no safe depository of the ultimate powers of the society but the people themselves; and if we think them not enlightened enough to exercise their control with a wholesome discretion, the remedy is not to take it from them but to inform their discretion"
"We never repent of having eaten too little"
"Truth is certainly a branch of morality and a very important one to society"
"He who knows best knows how little he knows"
"The natural cause of the human mind is certainly from credulity to skepticism"
"The good opinion of mankind, like the lever of Archimedes, with the given fulcrum, moves the world"
"It does me no injury for my neighbor to say there are twenty gods or no God"
"In truth, politeness is artificial good humor, it covers the natural want of it, and ends by rendering habitual a substitute nearly equivalent to the real virtue"
"The republican is the only form of government which is not eternally at open or secret war with the rights of mankind"
"Rightful liberty is unobstructed action according to our will within limits drawn around us by the equal rights of others. I do not add 'within the limits of the law' because law is often but the tyrant's will, and always so when it violates the rights of the individual"
"Question with boldness even the existence of a God; because, if there be one, he must more approve of the homage of reason, than that of blind-folded fear"
"No duty the Executive had to perform was so trying as to put the right man in the right place"
"It is in our lives and not our words that our religion must be read"
"In every country and every age, the priest had been hostile to Liberty"
"I never considered a difference of opinion in politics, in religion, in philosophy, as cause for withdrawing from a friend"
"I hope our wisdom will grow with our power, and teach us, that the less we use our power the greater it will be"
"I have no ambition to govern men; it is a painful and thankless office"
"He who knows nothing is closer to the truth than he whose mind is filled with falsehoods and errors"
"For a people who are free, and who mean to remain so, a well-organized and armed militia is their best security"
"Wisdom I know is social. She seeks her fellows. But Beauty is jealous, and illy bears the presence of a rival"
"Where the press is free and every man able to read, all is safe"
"Whenever the people are well-informed, they can be trusted with their own government"
"Whenever a man has cast a longing eye on offices, a rottenness begins in his conduct"
"Dependence begets subservience and venality, suffocates the germ of virtue, and prepares fit tools for the designs of ambition"
"Delay is preferable to error"
"Conquest is not in our principles. It is inconsistent with our government"
"Commerce with all nations, alliance with none, should be our motto"
"Books constitute capital. A library book lasts as long as a house, for hundreds of years. It is not, then, an article of mere consumption but fairly of capital, and often in the case of professional men, setting out in life, it is their only capital"
"Bodily decay is gloomy in prospect, but of all human contemplations the most abhorrent is body without mind"
"Be polite to all, but intimate with few"
"As our enemies have found we can reason like men, so now let us show them we can fight like men also"
"An injured friend is the bitterest of foes"
"An enemy generally says and believes what he wishes"
"An association of men who will not quarrel with one another is a thing which has never yet existed, from the greatest confederacy of nations down to a town meeting or a vestry"
"Always take hold of things by the smooth handle"
"All, too, will bear in mind this sacred principle, that though the will of the majority is in all cases to prevail, that will to be rightful must be reasonable; that the minority possess their equal rights, which equal law must protect, and to violate would be oppression"
"Advertisements contain the only truths to be relied on in a newspaper"
"A wise and frugal Government, which shall restrain men from injuring one another, which shall leave them otherwise free to regulate their own pursuits of industry and improvement, and shall not take from the mouth of labor the bread it has earned. This is the sum of good government, and this is necessary to close the circlue of our felicities"
"A coward is much more exposed to quarrels than a man of spirit"
"A Bill of Rights is what the people are entitled to against every government, and what no just government should refuse, or rest on inference"
"The advertisement is the most truthful part of a newspaper"
"That government is the strongest of which every man feels himself a part"
"Speeches that are measured by the hour will die with the hour"
"Our greatest happiness does not depend on the condition of life in which chance has placed us, but is always the result of a good conscience, good health, occupation, and freedom in all just pursuits"
"Our country is now taking so steady a course as to show by what road it will pass to destruction, to wit: by consolidation of power first, and then corruption, its necessary consequence"
"Only aim to do your duty, and mankind will give you credit where you fail"
"One loves to possess arms, though they hope never to have occasion for them"
"Nothing is unchangeable but the inherent and unalienable rights of man"
"Nothing gives one person so much advantage over another as to remain always cool and unruffled under all circumstances"
"Do not bite at the bait of pleasure, till you know there is no hook beneath it"
"Difference of opinion is advantageous in religion. The several sects perform the office of a Censor - over each other"
"None but an armed nation can dispense with a standing army. To keep ours armed and disciplined is therefore at all times important"
"Money, not morality, is the principle commerce of civilized nations"
"Merchants have no country. The mere spot they stand on does not constitute so strong an attachment as that from which they draw their gains"
"Mankind are more disposed to suffer, while evils are sufferable, than to right themselves by abolishing the forms to which they are accustomed"
"Leave no authority existing not responsible to the people"
"It takes time to persuade men to do even what is for their own good"
"It is our duty still to endeavor to avoid war; but if it shall actually take place, no matter by whom brought on, we must defend ourselves. If our house be on fire, without inquiring whether it was fired from within or without, we must try to extinguish it"
"It is neither wealth nor splendor; but tranquility and occupation which give you happiness"
"It is more dangerous that even a guilty person should be punished without the forms of law than that he should escape"
"It is incumbent on every generation to pay its own debts as it goes. A principle which if acted on would save one-half the wars of the world"
"If there is one principle more deeply rooted in the mind of every American, it is that we should have nothing to do with conquest"